Some of them are famous, others rather unknown, even though they are just a stone-throw away. 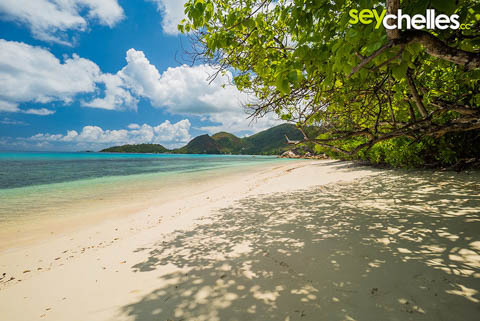 Get to know the beaches of Praslin. Unfortunately, our list is not complete yet, but expect a comprehensive list in summer 2015. 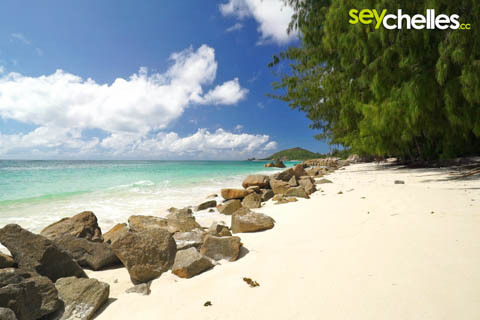 So far our focus has been La Digue and Mahé beaches. 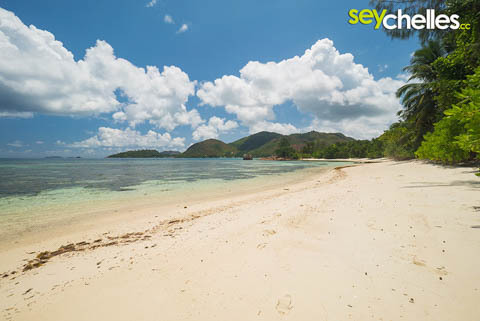 For the time being, we will start at the most famous Anse Lazio and tour the island clockwise. 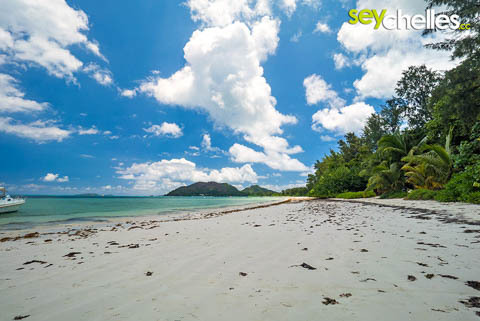 Anse Boudin is a deserted beach along the calm coastal road of Praslin. It offers some shadow and good possibilities to swim. 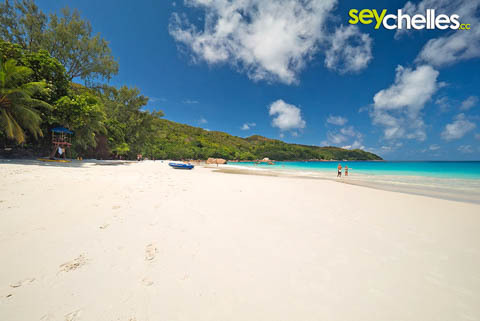 The beach is just a few minutes by car from famous Anse Lazio, that´s why hardly anybody ever stops here. 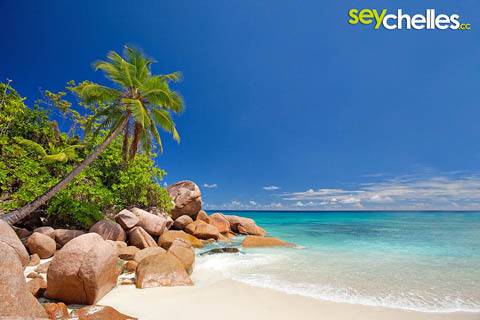 Would this beach be somewhere else on the island or in another country, people would absolutely love it. One small downside is the seaweed that gets washed on the northern beaches of Praslin regularly. But that happens on many other beaches too. This is a natural phenomenon (read more about it here). 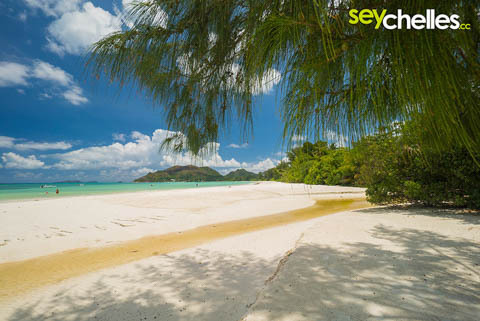 Anse Takamaka at The Raffles on Praslin is a perfect beach for swimming and relaxing. Despite The Raffles Hotel climbing the hills right behind the beach, it is open to the public and you can easily get there via the very nice beach promenade. One advantage of Anse Takamaka being the house-beach of The Raffles is that it is regularly cleaned from seaweed. That makes it even more beautiful for photographers like us. There is quite some shadow around, and of course, for hotel guests, there are sunbeds and parasols. 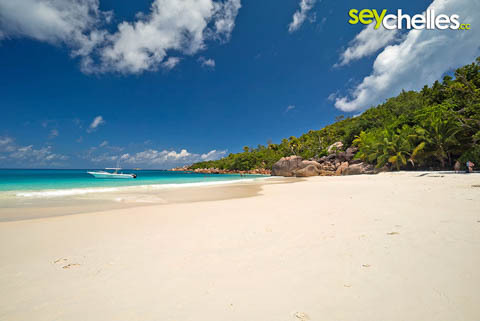 Anse Volbert or Cote d´Or Beach is the touristic hotspot of Praslin. While there sure are more beautiful beaches on the island, this is the place where most hotels and apartments are situated. The beach is really long and wide, perfect for a walk at any time of the day. Many options to go for a swim and the few fisher- and excursion-boats add to the nice look and feel of the beach. As you can see in our images, seaweed is present regularly (read more about seaweed). Shade is rather rare on this beach. Grand Anse in the south of Praslin is a very long beach, reaching from the airport all the way to where the road goes inland to Vallée de Mai. Unfortunately, this part of the beach suffers from erosion, so there is a long stonewall protecting the land behind the beach. There are a few small rivers running into the sea in this area that bring a lot of sand with them. Everywhere else, the lagoon is covered with seaweed. Seaweed is a natural phenomenon and while some people don´t particularly like it, others love to go snorkelling in search of seahorses and other fish.